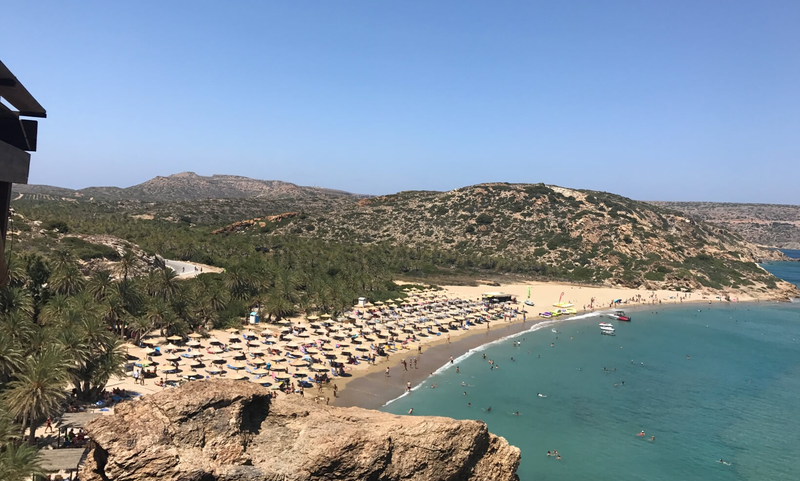 The Vai Palm Beach in Lassithi, Crete is one of the most famous beaches in Greece and one of the best sandy beaches in Crete. Many people believe it is the nicest beach in Crete. That’s for a good reason. Vai is the biggest palm forest in Europe and it has a long golden sandy beach and clear blue waters. What more could you ask for? But wait. 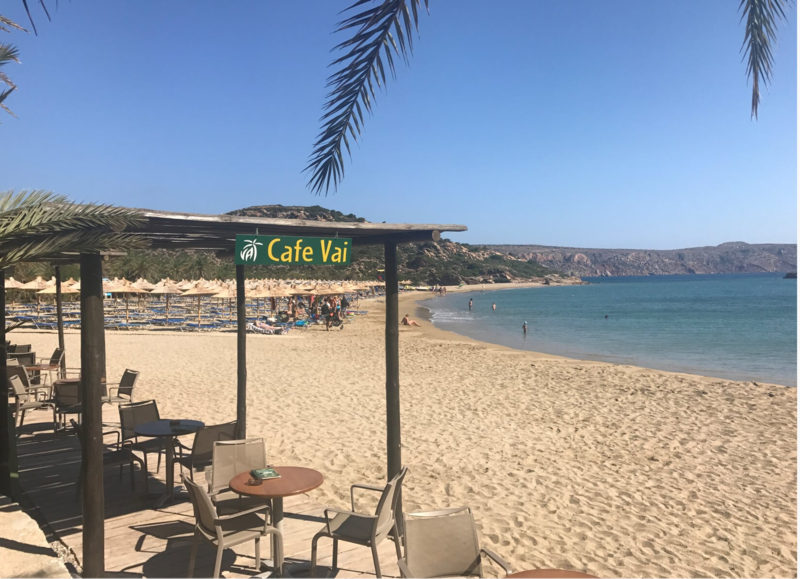 There are some things you should know about Vai beach and we have created this guide to help you enjoy it at its most. Read below to find out all tips you need to know about Vai beach. It is a 3 km long sandy beach, with a palm Forrest next to it. You will see more than 200 palm trees on the beach and there are in total around 5000 trees in the Forrest. Vai Beach is in the east part of Crete island in Greece. It belongs to Lassithi prefecture. The closest town is Siteia, which is a 30 minutes drive. What is the distance of Irakleio to Vai? It is 152 km. You will need to drive 2 hours and 45 minutes to get from Iraklio to Vai Beach. What is the distance of Chania to Vai Palm Beach, Crete? Chania to Vai Beach is 300 km and 4 hours and 45 minutes drive time. 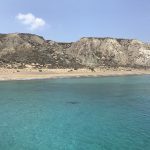 What is the distance of Rethymno to Vai Palm Beach? It is 229 km. 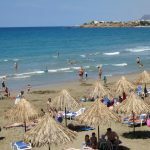 You will need to drive 3 hours and 45 minutes to get from Rethymno to Vai Beach. Here is a Vai Beach, Crete map that shows where is Vai Beach compared to Sitia, Heraklion, Rethymno, and Chania. How do I get to Vai Beach? You can drive there. It is 30 minutes from Siteia. The road is asphalt, with a lot of turns but it is safe. How was Vai beach created? The two legends say that the Arabs came to the Vai beach and the are the fruits and threw the seeds down. Or it was the Phoenix sailors who did the same. The science says that these palm trees are endemic to Crete and they have been on the island for thousands of years. How much does a day in Vai beach cost? Two sunbeds with an umbrella cost 4.5 euros. Fortunately, they are not that close to the each other, so they still leave you an adequate space to feel comfortable with all this crowd packed on the beach. Parking costs 2.5 euros. The parking lot can host around 250 cars. When it gets full, you need to park on the street that leads to Vai Beach, and this creates a long queue of up to 2km parked cars along the road. A cold coffee costs 3.5 euros. A pork steak costs 8.5 euros. A menu with tomatoes stuffed with rice, feta cheese, a small beer and Greek yogurt with fruits costs 12 euros. A bottle of water, 1 lt, costs 1 euro. There is no waiter on the beach, so if you need to order anything you need to get to the cafeteria which is on the right side of the beach, to get your drinks and coffees. 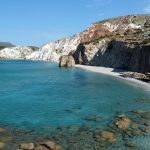 When is the best time to go to Vai beach? In July and August, the Vai Beach gets very crowded. Actually, the most crowded period is from 1st to 15th of August. During that time, you need to be there before 10 o’clock in the morning to easily find a parking spot and sunbeds with an umbrella. Otherwise, you will need to park on the road and walk six to seven minutes under the hot sun. The Vai beach is best experienced from May to October. The peak month is August. July and September are the two next busiest months. Where can I eat in Vai beach? There is a tavern inside the beach. It can host more than 200 people so no need to do a reservation. The food is just ok if you don’t want to move away from the beach. If you are a foodie, and you don’t mind driving to get some better food, then you have two options. If you prefer meat, you drive 4-5 minutes and go to Metohi tavern. It has local meat. Crete has local lamb, rabbits, and pork. Not so much veal or chickens, which are usually brought from other parts of Greece. If you prefer fish your best option is to drive fifteen minutes and go to Hiona village. There you will find the Taverna. 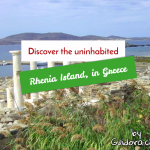 Go to Hiona Taverna which offers an amazing view of the bay of Crete. The food is very tasty but the portions are small. Can I camp in Vai beach? Are there water sports in Vai beach? Yes, there are water sports offered on the beach. Can I do scuba diving in Vai beach? No, there is no scuba diving center in Vai beach. Can I do Spearfishing in Vai beach? No you cannot. Due to the Greek crisis, some people from Crete did illegal Spearfishing for octopus here, which they sold to taverns. And the police stopped it. Is there a lifeguard in Vai beach? Yes, there is a lifeguard on the beach. Yes, it is. The water is not very deep for the first meters inside and there are many families I the beach. You can find shadow under the palm trees for your kids if you don’t like the umbrellas. Where can I stay in Vai beach? There is no accommodation offered at Vai beach. You will have to stay at another place. 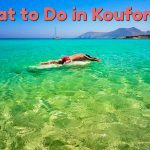 The closest area to stay is the Kouremenos bay which is around ten minutes drive time from Vai. Is there a place to shower in Vai beach? Are there toilettes in Vai beach? There is a tavern on the right side of the beach and you can use its toilets. They are pretty clean although basic. They offer a diaper changing bed for babies too.